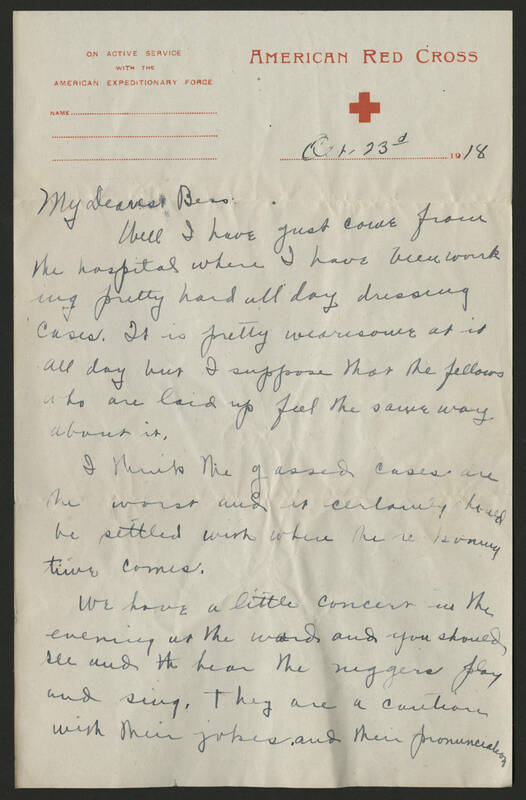 Oct. 23rd 1918 My Dearest Bess Well I have just come from the hospital where I have been working pretty hard all day dressing cases. It is pretty wearisome at it all day but I suppose that the fellows who are laid up feel the same way about it. I think the gassed cases are the worst and it certainly should be settled with when the reckoning time comes. We have a little concert in the evening at the ward and you should see and hear the niggers play and sing. They are a [caution?] with their jokes and their pronunciation.